Wanda Patsche exudes Minnesota nice to me. She always has a smile on her face and is very welcoming to answering tough questions about her farm raising hog and crops. Inside her, there is a burning passion for the truth to be told about family farms and how she raises pork for you and me. She’s what I like to call, a bacon farmer. 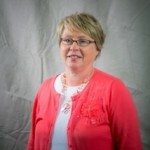 Originally from Fairmont, Minnesota and currently resides at Welcome, Minnesota, Wanda farms alongside her husband Charles which she highlights below in own words. Together they are parents to daughters Teresa, Alisa and Kristeena and grandparents to Cadence, Jadyn, Ainsley, Edwin and Esme. One thing I admire about Wanda is her consistent content creation on her blog. 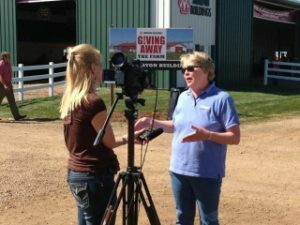 She doesn’t miss an opportunity to share about why and how her family raises pigs. She takes on issues. She volunteers. She speaks out. She loves her family. It all comes through clearly in her own words. Wanda could sit back and never care about straightening out the facts being shared about agriculture. But her jumping into it was a bold move and one she hasn’t given up on. She is a top agriculture blogger and not afraid to share her voice. By doing that she is inspiring and giving voice to another generation of farmers and agriculturists to boldly stand up against the mistruths of farming and animal welfare practices. Meet Wanda, a wonderful woman in agriculture. What is your role in agriculture today? One of my roles in agriculture is agvocacy. I am truly passionate about ag and love talking ag! 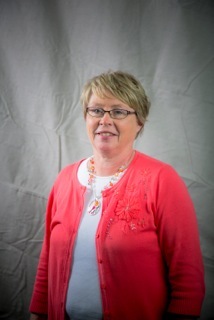 I am actively involved in the Minnesota Pork Producers, a speaker with the “Speak for Yourself” Farm Bureau program, blogger for AgStar’s “Women in Ag” MARL (Minnesota Ag Rural Leadership) program participant and a volunteer with CommonGround. In addition to these agvocacy opportunities, I also am very involved in social media. My other role in agriculture is being an active farming partner on our farm. I operate the combine and tillage equipment in the fall, prepare the soils for planting and apply crop protectant in the spring. I am also responsible for all bookkeeping and recordkeeping. How has agriculture shaped your life? It’s amazing how agriculture has shaped my life. I never grew up on a farm and honestly knew very little about farming until I met my husband. In fact, when I was in high school, I told my best friend (who lived on a hog farm) that “I would never marry a hog farmer.” That statement came right after watching her clean the hog barn on a Saturday morning. Well guess what? I married a hog farmer. God surely has a sense of humor! Needless to say, I have learned an enormous amount about farming over the 36 years I have been married. I have always been interested in agriculture, but it has only been recently that I have become more actively involved in agricultural advocacy. Being able to engage with consumers on what really happens on our farm and explain why we do what we do gives me a sense of accomplishment. I love connecting with consumers! The sign in my front lawn “my family is proud to feed yours” really sums up our responsibility as farmers to other families.. When was the last time you tried something for the first time? I love small town America! I would not change living here for the world! Our ag community is close – we are like family. We know and help each other. Our community is also deeply ingrained in agriculture, and more specifically hog farming. We live in the number one county in Minnesota for pork production and we are also nationally ranked. This progressive environment has been the result of some real ag visionaries and leaders in our community. These leaders are responsible for encouraging local farmers (including us) to raise pigs humanely using the newest technology. I am so proud and privileged to be from this community! When was the last time you tried something for the first time? I started a blog a couple years ago. It took me quite a while to convince myself to give it a try. I am so glad I started blogging because it has opened my world and allowed me to meet some wonderful people, many whom I call my friends. And it has also opened up some really exciting opportunities that I would never have if I didn’t blog. Connecting with a world much larger than myself allows me to grow and learn is just one example of the benefits of blogging. What do you do to encourage others? I try to be supportive to all people around me by engaging with them, both in person and online. I look at the positives each person is able to give and build on those attributes. Who/what serves as a source of encouragement for you? When it pertains to agvocacy, I have numerous social media friends that encourage me. Family and friends have also been a source of encouragement for me. What is your favorite home-cooked meal? Love grilled pork chops, with potatoes and green beans from the garden. And I love ice cream for dessert! If you had the opportunity to get a message across to a large group of people, what would your message be? I would love to share my story. I would tell this group of people that farmers care about what they do. I would share why they do what they do– along with examples. To show the emotions farmers go through when animals die and the sacrifices farmers make to give these animals the best care. To show farmers are continually learning and making improvements to their farms. The bottom line is – We Care! What makes you smile? My grandchildren make me smile. It’s as simple as that! 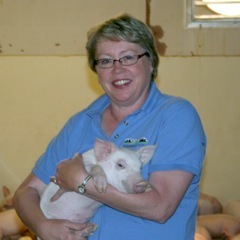 Thank you Wanda for your sharing your consistent, positive voice as a hog farmer, mom and grandma to social media and for your endless agriculture advocacy efforts! 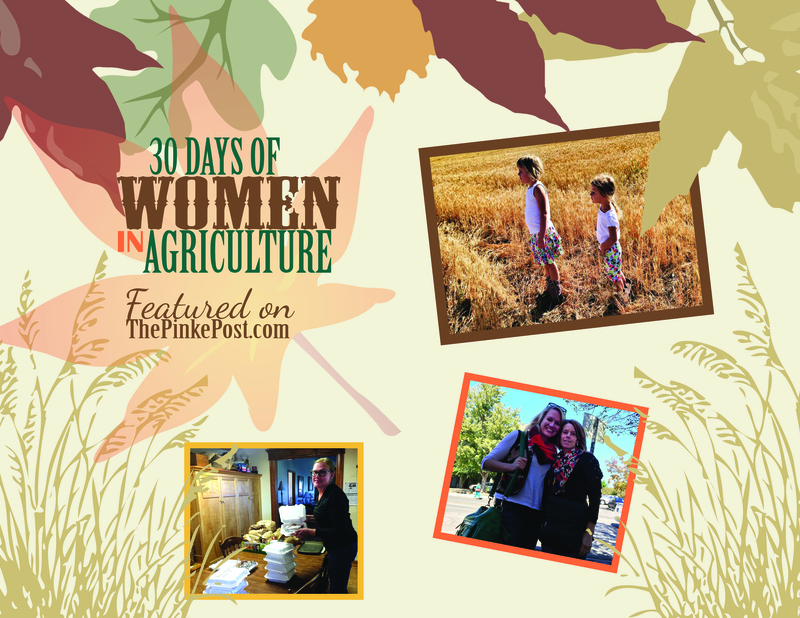 I am sharing five giveaways this month in between the 30 Days of Women in Agriculture features. All features are listed below for you to visit and meet these fabulous ladies. You can leave a comment on this KLG Designs Giveaway on one Woman in Agriculture feature you have read and enjoy this month and be entered to win one of two pairs of handcrafted earrings this weekend!